Stop wishing and TAKE ACTION with our online whole-health nutrition program. An exclusive framework to improve your diet + health (without deprivation or crazy diet rules). Next round starts March 6th! Register here. Food should be fun and easy – take the stress out of food and get back to enjoying it without headaches or hassle. Learn WHAT to eat, WHEN to eat, and most importantly: WHY. Stop dragging through your day and living coffee cup to coffee cup. Keep up with your kids, wake up refreshed, and get time back in your day for the things you love. Learn just how GREAT your body is designed to feel. Reduce inflammation, blast excess body fat, build muscle, decrease your toxin load, and more – all without restrictive diets. Are you tired of feeling like you’re dragging all the time? Do you want to feel strong & confident in your own skin? Are you stressed just thinking about how to squeeze in time to menu plan and meal prep? Are you frustrated because you’re eating right and working out but you’re not seeing the results you want? Are you sick of battling cravings or feeling like you constantly want to eat? Are you confused about what’s “healthy” and what’s not? Do you have nagging symptoms that won’t go away, like stomach problems, sore joints, itching skin, acne, headaches, or brain fog? Have you started and stopped a million diet plans because they weren’t sustainable or realistic? Prioritizing your health sounds so wonderful and idealistic, but actually making it happen when you have a million other responsibilities is just hard. But guess what? It doesn’t have to be so impossible. 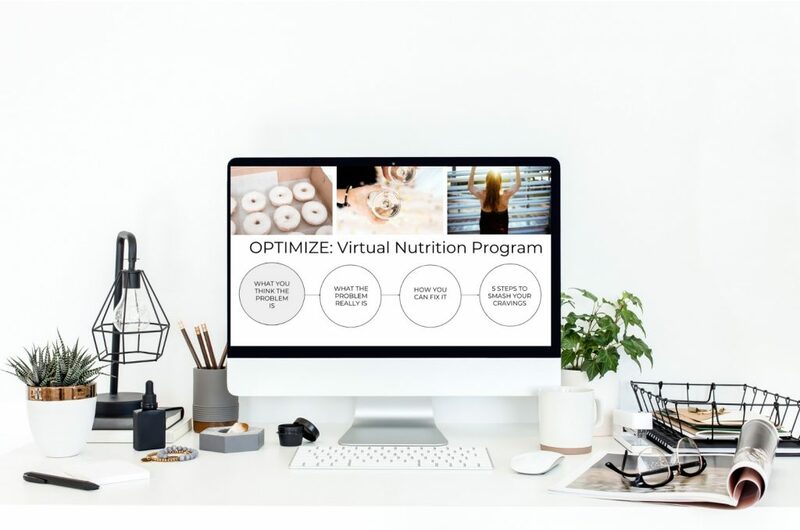 With our dietitian-led OPTIMIZE virtual health + nutrition program we give you the exact roadmap you’re looking for. Our exclusvie framework sets you up for success with a realistic and achievable plan for not just your diet, but your health as a whole. No starving yourself. No spending hours in the kitchen every day. No deprivation or crazy diet rules. In fact, most of clients end up eating MORE then they were before, while spending LESS time working out. They build muscle, blast fat, and ramp up their energy levels. Now, don’t get me wrong. It’s not easy or magic – you can’t just clap your hands and expect a six pack. But you CAN expect results. Cutting edge nutrition strategies from your personal Registered Dietitian – this isn’t your mama’s 1980’s low fat diet gimmick. Focus on your health as a whole, from stress to sleep to toxins, inflammation, and more. Put your health back into your own hands with this realistic, straight-forward plan. Whether you’re trying to ramp up your energy levels, shed a few pounds, or crush those nagging symptoms, the OPTIMIZE program is designed to help you smash your goals and get you feeling your absolute best. Together we’ll train your body to effectively burn fat and build muscle, utilize nutrients the way it’s supposed to, and optimize each and every one of your body’s systems to operate at it’s prime. We’ll cover the science (in an easily digestible way) so you can understand the WHY behind the strategies and use them for the rest of your life – not just a few weeks. We’ll also cover the HOW in a realistic, real-life, I-don’t-have-10-hours-to-spend-in-the-kitchen kind of way. We don’t only look at what goes on your plate: we breakdown the big picture and take action on every aspect of your health: from food to sleep to stress and beyond. Video content delivered straight to your personal dashboard. It’s all the stuff we cover in 1:1 sessions but accesible when ever is convenient for you during the week, at a price lower than the cost of a single consultation. Got questions? Your RD has answers. Submit questions any time in the private support group or during a live video Q+A session with your Registered Dietitian.